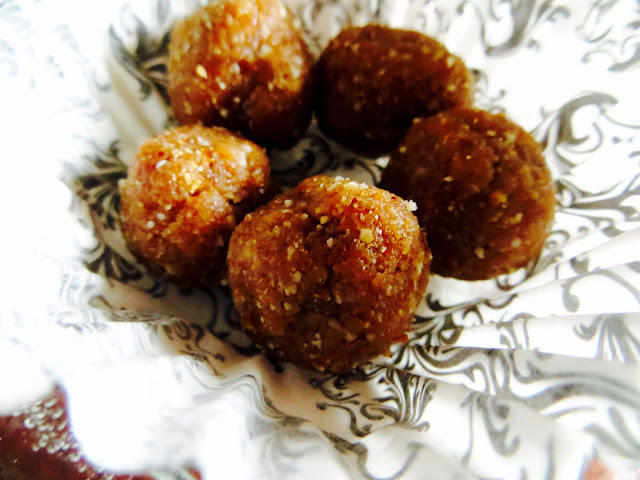 I came up with this recipe when my son, who is a big sweet lover, demanded for an instant laddoo. With only 3 ingredients - peanuts, sesame and dates, this laddu can be made in a jiffy. It is quite healthy too as it does not have sugar. Instant energy guaranteed. Can also be kept in your child's snack box without any guilt. Heat up a pan and dry roast the sesame seeds till they become slightly brown. Make sure they don't become over roasted. Remove from pan and set aside to cool. In a blender, first take the dates, and make a smooth paste out of it. Set aside in a bowl. Now take the roasted peanuts and sesame, and grind them till you get a fine powder. Add the peanut and sesame powder to the dates paste, and knead nicely to mix. Make small balls out of it. The stickiness of dates acts as the binding factor to make the laddoos. Peanuts can also be replaced by any nut/dry fruit of your choice. Any combination of cashew nuts, walnuts, almonds, raisins also work fine for this recipe.